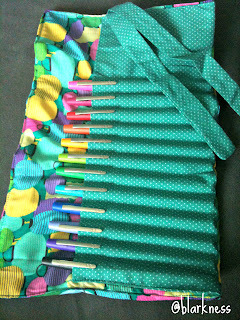 I've been sewing since as long as I can remember. Do you remember when we had grade 8 home economics when we sewed a stuffed animal or maybe in grade when we got to sew a jacket? 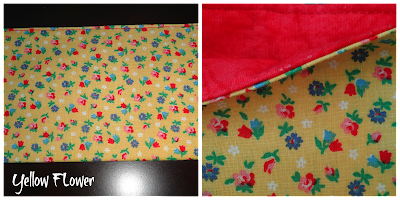 Well, my mom has always been sewing so I picked it up from her at an early age. She used to sew us clothes, curtains, tablecloths, anything you name it. It only seems fitting that she would pass down this hobby to me. I've taken some sewing classes through my teens and adulthood. I've made boxers, pillowcases, shoe bags, a jogging suit (yes, and I was so proud of it until it shrank) and as of late, baby slippers. These are super easy to make and take no time at all. I wanted to do a tutorial but my mom was against it. She said I should keep it to myself. That sneaky devil, she doesn't like sharing, lol! 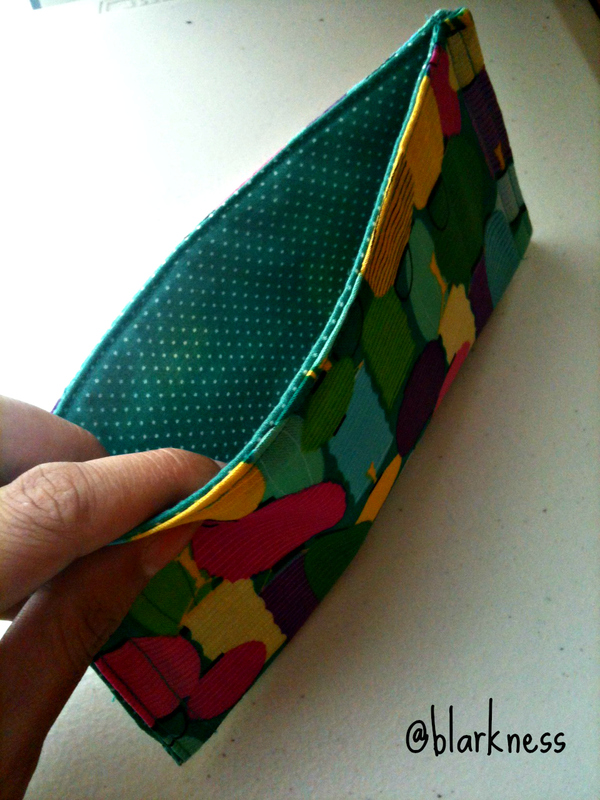 I wanted to make this wallet, so I can save some cash in here, you know for rainy days, Christmas presents, etc...like a piggy bank but for bills instead of coins. And then I found another use for it, I could use it to stash my receipts from all the shopping I did, so that it's all in one place. Brilliant huh? You could also use it for coupons. After making over 20 wallets, I had to graduate to something else. I told my mom to relax and that I wanted to make this next project on my own. I remember seeing this makeup brush roll up as a project at The Sewing Studio and found an easy tutorial here. I'm pretty proud that I did it myself and so is my mom. Then it dawned on me that if I could make this, why not make a holder for my Papermate Flair pens? If you love writing and are a fan of pen, you have to buy the set. They are awesome! 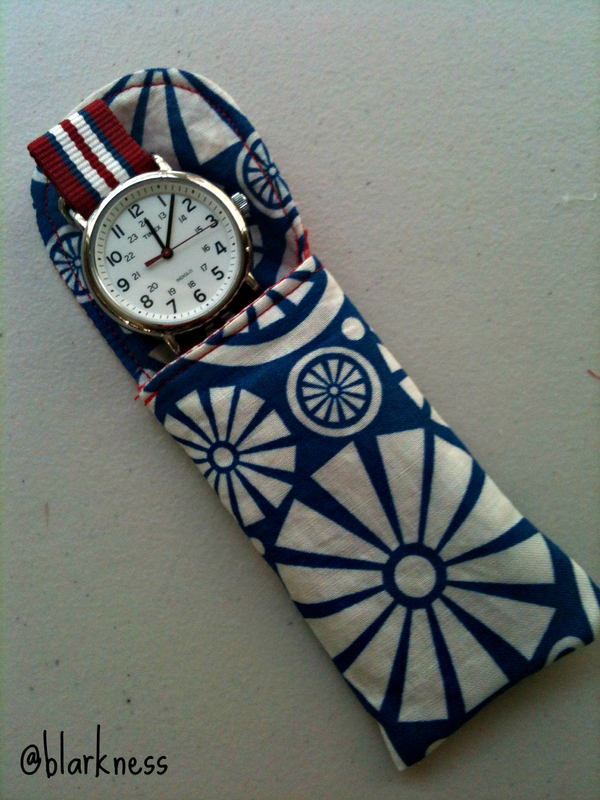 While I was packing my carry-on to return home, I realized that I didn't want to carry the boxy packaging that my husband's watch came in so I made a little carrying case. It even matched the watch! 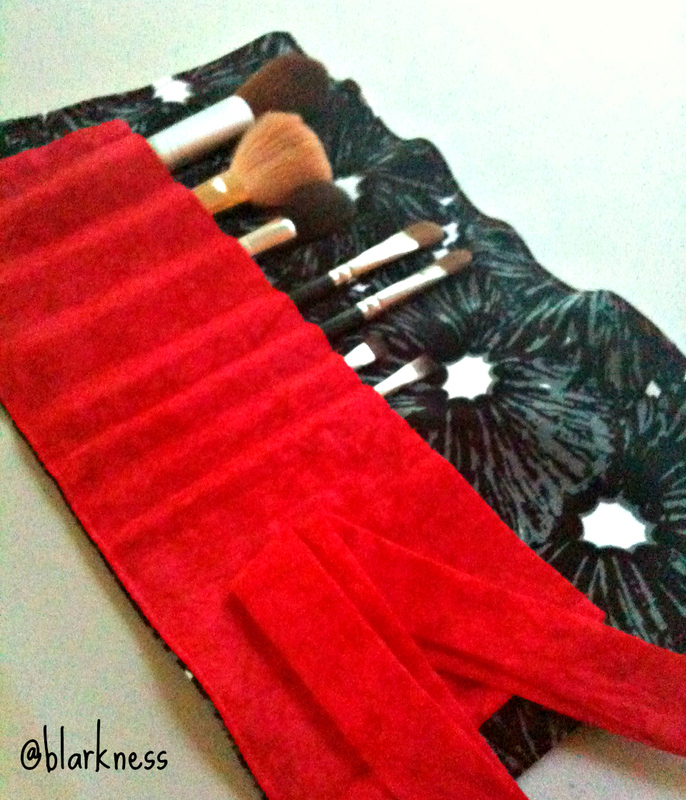 I also made microfiber cleaning cloths and a brush holder and eyeglasses case for my mom. I can't believe how much I was able to sew over the weekend. 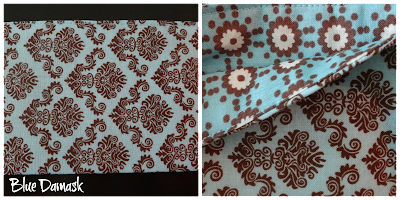 I am really itching to buy a sewing machine, and have been researching all week. 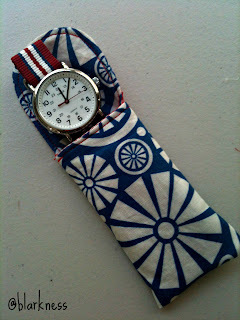 I am just scared that I will buy it, sew for a week and it will be tucked away in the corner collecting dust. I am planning to buy a decent quality, inexpensive machine. If you have any suggestions, I'll gladly accept them. I honestly don't want to rush and just pick up any machine, plus I still have to clean out some space in our den to make room for it. 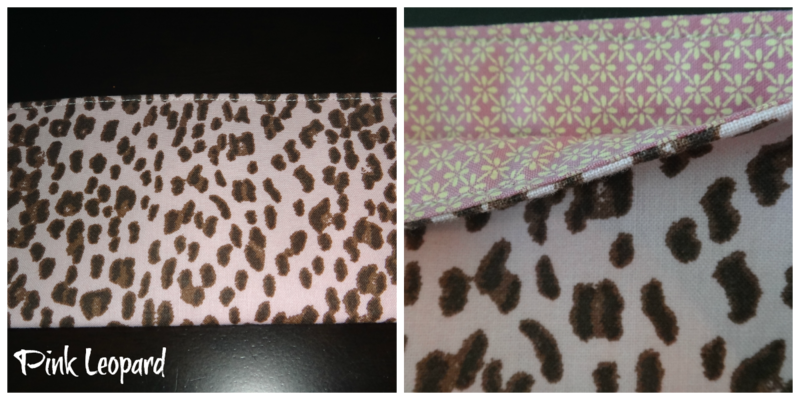 Now while I saw sewing and posting on Instagram, some people were asking me if I would be selling the wallet and for how much. First of all, I don't have a sewing machine yet and am not in the right headspace to open up an Etsy shop, so for now, I'll just give away some of the extra I made. Simple and easy right? 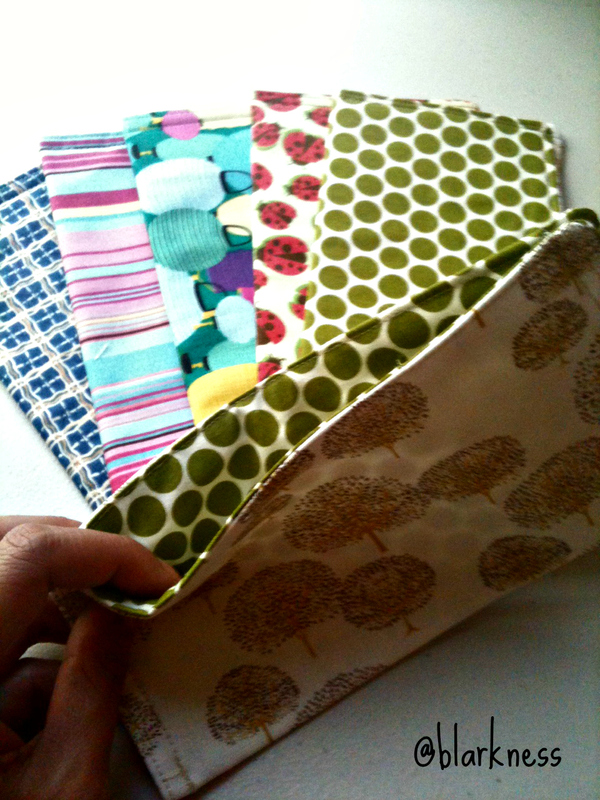 I will randomly pick a winner for each of the four wallets, you'll have until next Friday, September 7 to enter. I will announce the winners on Saturday, September 8. Good luck and feel free to spread the word. Last week I returned from a eight day trip to San Jose to visit my mom and stepdad. They graciously offered to fly me out since I had several vacation days I needed to use by the end of the month. I hesitated a lot, mainly for two reasons 1) Mike wasn't able to come with me and 2) since he couldn't come, I would have to fly out by myself. This scared the sh!t out of me. Now that I did the trip, flying alone was pretty easy. I sat aisle both ways and had no problems at security or immigration. ...only to wake up at 4:30 am. We did more shopping on Tuesday - TJ Maxx, Ulta, Target, Kohl's, Ross...let me just tell you that my mom is a pro at scouring the clearance racks for cheap stuff. I just don't have the patience for it. Later in the evening, my mom's cousin came over for dinner. Wednesday, we all woke up early to go to my stepdad's work. They have a really cool cafeteria so we had breakfast there and then we let my stepdad go to work and again, my mom and I went shopping. This time, we hit Daiso, Trader Joe's again, BevMo, Target and Kohl's. For lunch, my mom took me to my first ever Taco Truck. I thought I was just going to have one but for $1.25, they are so small, I ordered two - Pastor and Pollo Asada (Pork and Chicken). It was so good I had to order one more - Carnitas. My mom and I had 6 tacos all together and shared a Diet Coke and it only cost us $8.50. We picked up my stepdad later in the day and headed over to San Bruno to a little restaurant called Patio Filipino to meet with my cousin, Marilen. What I find hilarious is that she is a cousin from my dad's side and although my parent's have been divorced forever, Marilen and my mom are really close, cool huh? 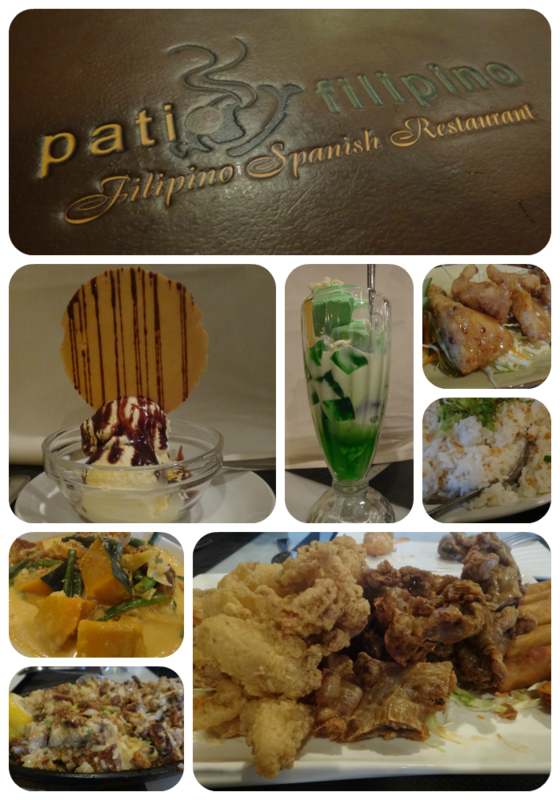 The food is delicious, totally family-style so we definitely ordered too much. Marilen gave me a care package of her favorite Trader Joe's products. We didn't get to spend that much time together. Unfortunately, since me coming to California was spur of the moment, Marilen already had a trip booked to LA to follow her beloved Giants for their road games. Thursday was my stepdad's birthday. He took the day off so we enjoyed a leisurely home-cooked breakfast made by my mom and then picked up his mom to go watch The Bourne Legacy. 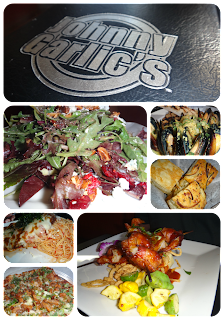 During the week, while watching Diners, Drive-ins and Dives, we found out that Guy Fieri's Johnny Garlic's restaurant had a location in San Jose that opened up a couple of months ago. 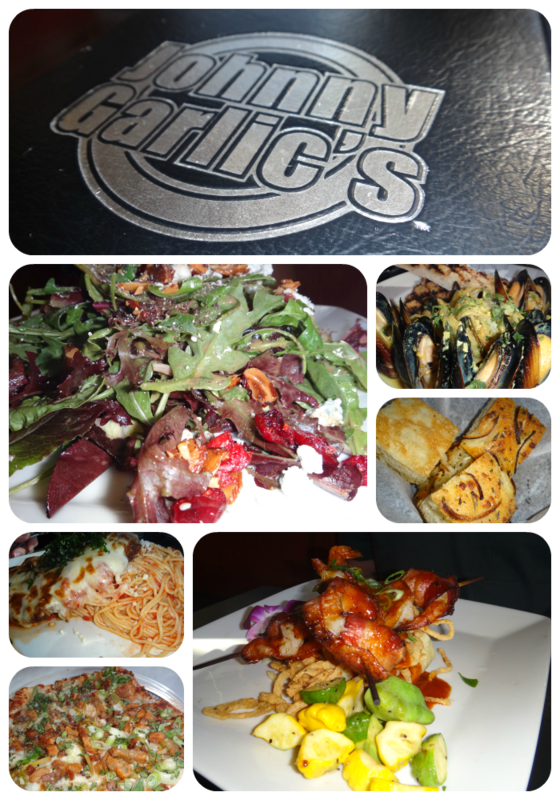 Since we eating early, we were able to take advantage of some happy hour specials. After dinner, we past by Psycho Donuts to get my donut fill and then we ended the night at my stepdad's mom's house for some cupcakes. Friday, my mom's friend came over for breakfast to meet me and then my mom and I headed over to Gilroy Outlets. I felt bad that I still hadn't bought anything for Mike. We went to American Apparel (where I got three pairs of shorts for Mike for only $12 each), J. Crew and Forever 21. We then picked up Gamble (my stepdad's grandson) and brought him back to the house so I could play Wii with him. I spoke to him a week before I was arriving and he had asked me if I could teach him how to play Mario Party. 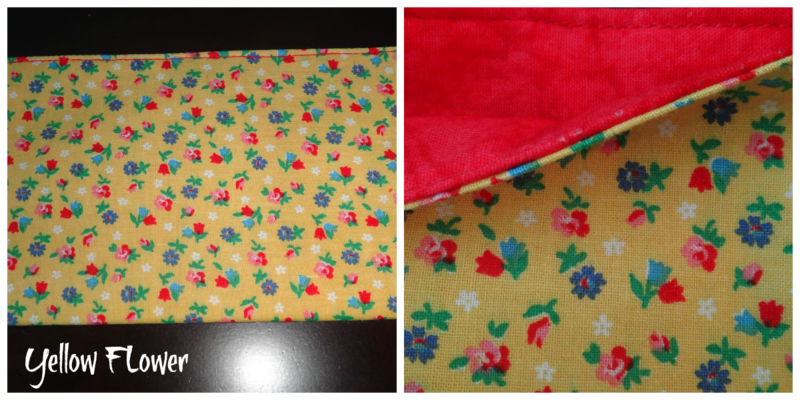 All weekend, I sewed to my heart's content. I tried out several projects and then posted them up on Instagram. 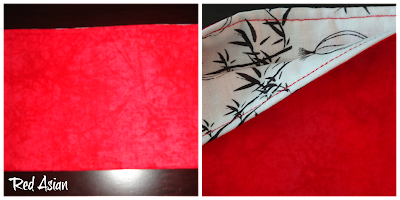 I will write up a separate post on what I sewed and will even have a giveaway later this week. My mom was so proud of me with all the projects I made. We didn't even go out all day Saturday because we were sewing. Sunday, we stepped out to get some nail polish and grab bubble tea. Then ate at a local favorite, Casa Teresa for some traditional Mexican food. Monday was more sewing, shopping and manicures in the evening. I did have In-N-Out again for lunch. Tuesday, my flight wasn't until 1:30 pm so my mom and I killed some time at Target and Macy's. She showed me downtown Sunnyvale which has a strip of restaurants and live music all summer. It's definitely a place I have to come back to the next time I come to visit. With my tiny carry-on luggage stuffed with all my shopping (my mom is the #1 packer) and another bag filled with cookies, I got dropped off at the airport. I am happy to report that there weren't any tears this time - we just pretended I was going on vacation to Mexico and would be back after a week. This little trick worked like a charm. It was such a fun trip and all we did was shop and sew. In the end, it doesn't matter what we did, all that mattered was getting to spend some time with my mom. Leaving may be a little hard but I know she is in good hands. If you want to read the guest post I wrote for her blog before I left, check it out here. I just returned last night from my trip to San Jose to visit my mom. I thought I might blog while I was there but I only managed to get out one post. I was having too much fun to write, although my mom still managed to write daily posts while I was there. 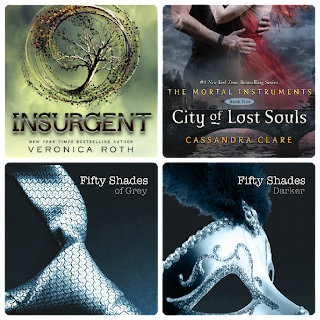 So for today, I am doubling up doing last Thursday's topic on Current Obsessions and this week's Fun Summer Reads. There are lots of things I am currently obsessed with so my list could go on forever and ever, so I will narrow it down to four things I can't get enough of RIGHT NOW! 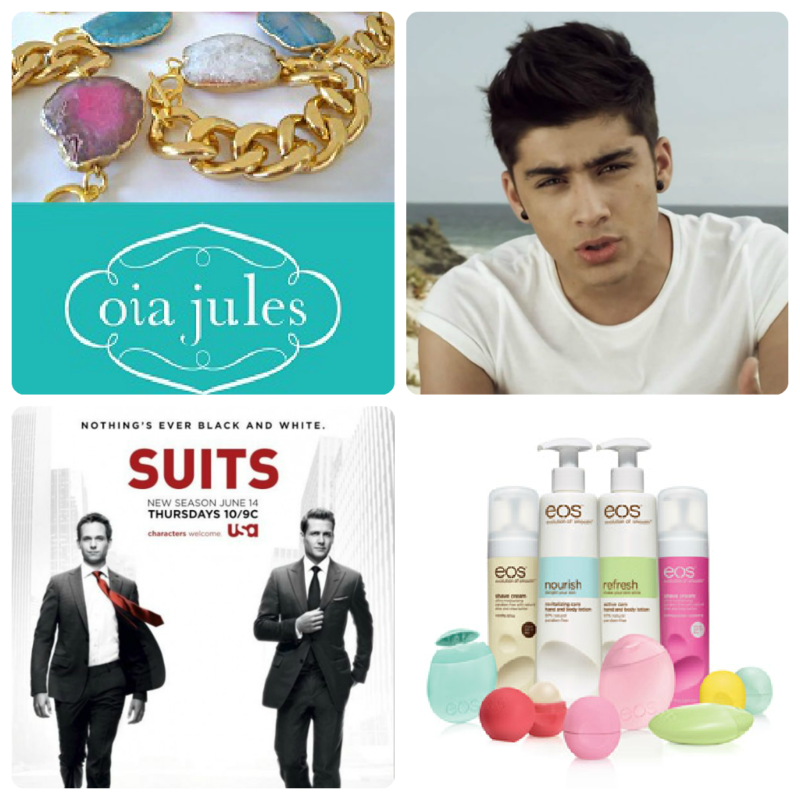 Oia Jules: I've had my eye on Elizabeth's Etsy shop, Oia Jules for over a year now and when a 20% promo code came out on twitter, I knew that my chance had come to buy and see if I liked her jewelry. And guess what, I am in love. I purchased the Chunky Gold Chain Link Bracelet with Smoky Quartz and I couldn't be more happy with what I picked. I foresee a long lasting relationship with me and Oia Jules. I plan on buying a necklace next. 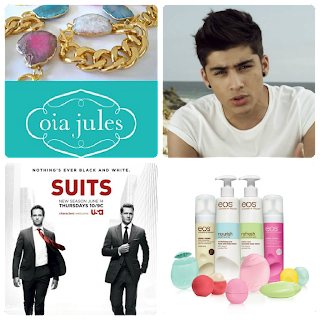 Zayn Malik/One Direction: Don't judge but I bought the One Direction Up All Night Live Tour DVD. Yes, I am that girl. Once a pop princess, always a pop princess, no matter what age. Zayn is such a cutie and I do realize that he is too young for me, but wasn't everyone obsessed with Taylor Lautner when Twilight first came out? Anyway, Stole my Heart from 1D is on heavy rotation on my iPod. eos Products: I first fell in love with those spherical lip balms, but I have since discovered the flat hand lotion and next up, their shave cream. Although eos products are available in Canada, it's super expensive compared to the States. Thankfully my mom replenishes my stock every so often. This week's topics is fun summer reads. I have read a couple of books over the summer and Fifty Shades is probably the best book to read pool/beach side because it doesn't require your full attention, it's just for mindless fun. And mindless fun is the perfect summer read. For past summers I have read anything from Sophia Kinsella, Meg Cabot or any of the Gossip Girl books. I also think anything light and funny like Chelsea Handler books would be a fun summer read. You should never be reading heavy or sad (aka Nicholas Sparks books) during the summer, save those kinds of books for the winter. What books have you read over the summer? And what are you currently obsessed with? Sorry I haven't blogged in a while. I am out in California visiting my mom. I'm having a blast here shopping, eating and just spending time with my mom (and stepdad). I have barely checked my Twitter, and I know that I am going to end up with 300+ in my Google reader to catch up on. Today's FITBF is perfect because it is hot here in San Jose. What I am not use to is how it's chilly in the morning before 10 am and then it gets super hot and totally cools off again in the evening. Good thing I brought a sweater. I'm a little upset that I missed out on yesterday's Random Thursday because I would have loved to share with you my current obsessions. Maybe I can double up next Thursday. Well, here are my blanks and I probably won't blog again so have a great weekend and I will share with you all my great shopping finds when I return home next week. 1. The best thing to do on a hot day is to call up your friend with a pool and see if they will throw an impromptu pool party. 2. The best place to be on a hot day is on a patio drinking sangria. 3. The best thing to eat on a hot day is a salad or bubble tea or definitely popsicles. 4. Hot days are better than cold days. I will take hot humid days over gloomy rain or brutal winter weather. 5. My go to uniform on a warm summer day is a tube dress. I don't like anything on my shoulders when it's hot and I like wearing dresses in the summertime. 6. The scent that reminds me of summer is coconut, like Hawaiian Tropic sunscreen or lemons and limes. 7. My favorite thing about summer is that everyone is always in a better mood, and the fact that I always kick off the summer with a beach vacation. It's past the halfway point in 2012 and even though I set some mini goals for the year, I have no idea if I accomplished any of them. I think it's about time I take a look at what I wrote (warning: it's an eye sore with so much words and no photos, it's mainly for me to see where I am at, you know, a status update). *Stop buying things just because they are on sale. I live in a tiny condo, there is no room to stockpile. Most of the time, the sale items are things you don't really need. <--- I'm getting pretty good at walking away from a sale. The only time I caved and stockpiled was when I found I.C.O.N shampoo and conditioner on sale for $2.99 each. I bought eight bottles. Even the people at my salon said it was an awesome deal and asked if I could get some for them. *Pick up another hobby. 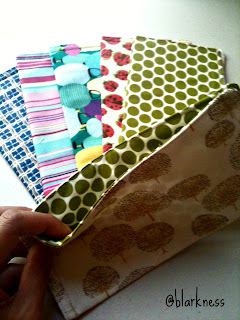 Last year, I took sewing classes. So it's either buy a sewing machine or take another class of some sort. Maybe knitting? <--- No sewing machine yet but since the Fall is approaching, knitting classes are looking bright in my future. *Read 25 books this year. Last year, my Goodreads goal was 15 and I surpassed it by reading 19. <--- I am at 13 books so I am halfway there. *Write more snail mail letters to family and friends. <--- I wrote some letters to my aunts in the Philippines. Maybe while I am at my mom's I will write more letters. *Instead of hoarding magazines because there is something I like in an issue, I'm going to tear out the page and paste it in the ideas journal I received from the lovely Candice. <--- this year, I have been reading, ripping out pages and tossing the magazines right after I read it. I just haven't pasted all the clippings into the journal. *Use Pinterest more to get inspired. <--- Pinterest has taken over my life. I pin but I don't normally do the craft or bake the recipe right away. 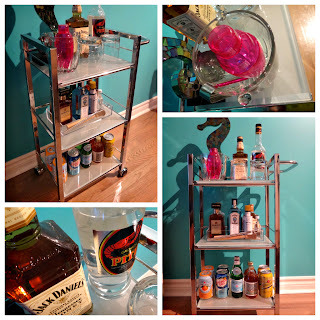 I did use Pinterest to get inspired to create our bar cart. *Try to do more craft projects. <--- so far, I have only made some racerback tanks. *Go on at least two beach vacations and one city vacation. Going away is the only thing that keeps me sane. <--- One beach vacation down (Playa del Carmen, Mexico), one more to go (Punta Cana, DR in December). As for city vacations, Mike and I went to San Jose in April but that's more family visiting not exploring. Hopefully Vegas or NYC will be in the near future before the year ends, although I wouldn't mind going to Chicago, Boston or Portland for a weekend trip. *Write down what I eat and what exercise I did in a journal. I want to find out what upsets my stomach but also keep track of my eating habits. <-- I know what upsets my stomach now...huge amounts of bread, dairy and red meat. This has helped me a lot knowing what it is that upsets my stomach. I have been avoiding these foods but it's been tough especially with pizza. I was working out a lot April-June, I was even keeping track of how how long I ran and what exercises I did on an app but then I found it took up too much of my time. *Obviously, try to lose 8 pounds. <-- At my peak of working out and watching what I was eating, I lost 3 lbs but it's been fluctuating a lot these days. Once I come back from Cali, I am going to start eating healthy again and get back to working out. My friend Kat has totally inspired me. *No eating after 8:00 pm on weeknights. <-- I try, and I have really tried. When I was on vacation in Mexico, we set our dinner for 8:30 at night, It's vacation so it doesn't count. I think I have been pretty good at this. *I need to shop buying clothes for the next three months. Just in December I bought two winter coats, three pairs of boots, three silk blouses, two sweaters, four pairs of pants and a watch. I did enough damage in one month that most people do in three months. <--- for the most part, I didn't buy a lot of things. I did pretty good. *No more buying nail polish, bracelets, makeup or scarves. <--- I was awesome with this. *Limit my nail polish wear. My nails are so soft from me buffing them because they get stained too easily from the dark polish I wear. <--- I stopped wearing polish for a while but picked up again in June. Summer without nail polish is just wrong! *Try to not wear black all the time. When spring arrives, I want to switch to pastel colours. This is when I will start to shop again. <--- I didn't switch to pastels but I did start to wear bright colours and I haven't been wearing ALL black throughout the summer. *Do once a month date night with Mike. When we were in New York, we both discovered that we love sitting in hotel bars drinking. We are going to check out different hotel bars in our own city for date night. <---We have yet to go hotel bar hopping. As for date night once a month, it never happened but I think the both of us are content with staying at home and just hanging out with each other. *Visit my mom this year. <-- Mike and I went in April and tomorrow I am going on my own. *Make a huge effort to see or talk to my dad. <--- definitely need to work on this more but it's hard now since he's in the Philippines until the end of October. *Call at least one friend a month and see how they are doing. I will pick a different friend a month. We never make phone calls anymore and have live conversations. Or even better, Skype - yes, I am talking to you Elisse. Everything is over text, What's App or Twitter these days. <--- I do make Skype dates with Elisse and recently I got to Face Time with Reni. I don't think I have called up one friend recently...so bad of me. I did connect with a friend from my past (actually a bridesmaid of mine), we did a string of catch up emails but never spoke on the phone. I also got to see my old school friends for drinks early in the summer. I love catching up with old friends. *Make more of an effort to write posts for our travel blog, Beach Junkies. <--- it took me one month after our vacation in Mexico to write up the review for the resort we stayed at. I do have some posts in mind, I just have to write them out. The plus side to all this, Beach Junkies are brand ambassadors for a Karisma Resort and have been participating in weekly mission to promote the brand. Check out the post I wrote for their blog. *Either try to enjoy my job or get out, meaning start applying for jobs. <--- haven't tried hard enough. *Try to let things go and just do as I am told even if it's ridiculous. Trying to defend myself or point out something to my boss takes up too much energy. <--- I totally just do what I am told even though I think there is a more effective and efficient way to do it. CONCLUSION | I haven't been that great with my goals and it's probably because I wrote them on my blog and then forgot about it. They are/were attainable, I just need to post it somewhere where I can see them. I still have a couple months left in the year, so I can work on the others I have yet to accomplish. How are you doing with your own goals? ...to give into the fact that you can no longer wear heels. Maybe I can in Autumn but right now since I am walking to and from work everyday, I need to be in flat shoes. Sure, I feel short and ugly in flats but as you get older, you realize sometimes comfort trumps style. ...to be a little nervous to fly for over 4 hours on your own. I have flown on my own for work but it's only a 38 minute flight to Ottawa. Sure, I go on vacation every year but Mike is always with me. I feel like if I can make it to SFO on my own, I deserve an award. ...to be a little upset that Vegas or Disneyworld is no longer in store for Mike and I next month. Damn you government and your taxes. Bonuses are no longer a treat since you only get half of it anyway if you don't put it in an RRSP. ...to be so annoyed that my skin is constantly irritated. Adult acne is flaring up again big time. I thought I could blame it on my period but that's not it. I am trying to blame it on the new BB Cream I was using. We will see in a week if it is indeed the cause. ...to be a little sad to be leaving hubby behind while I go to visit my mom in Cali. I always travel with Mike and we always have a great time but this visit is strictly for my mom and I to do some major mother-daughter bonding. I hope Mike doesn't get drunk every day with the new bar cart and all (btw, my coworker calls him the Asian Don Draper). ...to really like hanging out with Timona (she knows who she is). Like she says, we are kindred spirits. We have Chipotle dates, lots of inside jokes and really, we just get each other. I don't think I have had an office mate since my days at Taxi that I get along with so well. Now, I can't imagine my life without her. ...to again we really upset with the casting of Jace Wayland for Mortal Instruments - City of Bones. Jamie Campbell Bower is not the right guy for the role. I was thinking more on the lines of Alex Pettyfer (damn him for turning down). From the looks of it, all other guys in the movie will be hotter than Jace (which shouldn't be the case if you've read the books). Check out the guy playing Mangus Bane, now that's good casting! I can't wait for this movie but I know it's no HG or Twilight. ...to get slightly annoyed when you see people post the same photos on their blog, Instagram and Twitter. I really don't need to see your photos three times in one day. Change it up a bit. With that said, I know I have posted photos on two different social media outlets but I promise not to make it a habit. It has been ages since I have completed a Fill in the Blank Friday. I am glad Lauren brought back the old format - it's what she is known for and it's probably how I started following her blog. This lady is fabulous, she is stylish, a great mom and just a person who loves life, her hubby, her baby (who is the most adorable baby you will ever come across), her dog, her home, her city, etc. She's a role model and a sweet and caring person. I want to wish her a very happy 28th birthday this Sunday. If you want to also fill in the blanks, you can join here. 1. The age I will be on my upcoming birthday is 36. Damn I am getting old. I don't feel 36 and I don't think I look 36. Actually my co-worker said I look like I am 12. I know they are totally exaggerating but I do look a lot younger than my actually age. Most of the time, I get 25-27. 2. The best birthday present ever would be a beach vacation. I have yet to actually be on a beach for my birthday. 3. My favorite birthday to date was my 30th birthday at a local bar. It was kinda a last minute thing but I was really surprised to see so many people come out, even some guys I hadn't since in years. I also felt really great about turning 30. I just before I turned 30, I became a wife and homeowner. I honestly felt I was in a good place in my life on my 30th birthday. 4. Birthdays make me feel old now a days. Birthdays use to be a lot of fun, filled with presents, food, drinks, good company...now for my birthday, I just want to chill out. Maybe this is a sign that I need to go away for my birthday. 5. The worst birthday I ever had was when I turned 25. I can't recall if I did anything to celebrate but I do remember crying in my living room because I was really sad to be turning 25. I know...pathetic huh? 6. When I was born I was 7 lbs and 20 oz (I think) and was born at 7:20 pm. That's about it...I don't know if there is some special story about my birth but I am sure my mom will comment if she has a story to tell. 7. So far my favorite age has been 21. I had the time of my life that year partying and just having fun. I love getting mail, especially when you are not expecting it. I was paired up with Em from m.pir.i.cal, also know as the co-host of this swap. Imagine my surprise when I received the email from Lin from Linny's Vault that I would be paired up with one of the co-host!!! Oh the pressure! I have to admit that I was a couple days late in sending out Em's package and I didn't do a good job with introducing myself when we first got our swap partners. So the first email Em gets from me is an apology that I have sent out her package late. I guess we were a match made in heaven because she sent my package late too! Today I received a lovely package from Em and now it's time to link it up so other bloggers can see what I got. Everything in the package was bright and colourful, definitely a reminder of summer. 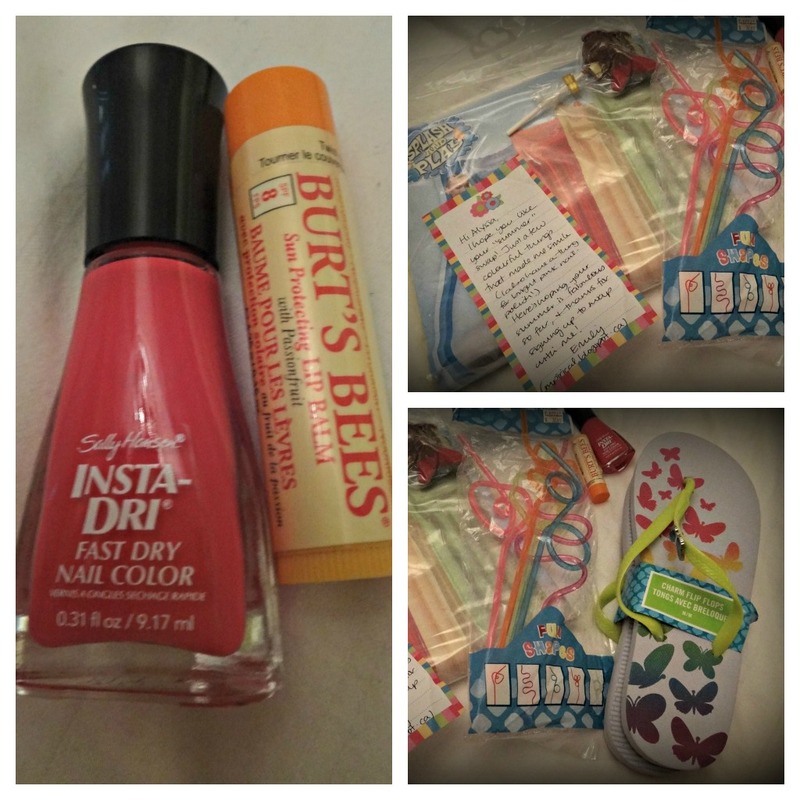 Included was a floatie, crazy straws, flip flops, a chocolate lollipop in the shape of a fish, Burt's Bees lip balm and bright pink nail polish. Thank you Em for the cute stuff and a big thank you to you and Lin for hosting this swap. Coordinating these swaps is difficult and time-consuming so thanks for taking the time to do this! Do you ever think of something you want and then get so obsessed over it? 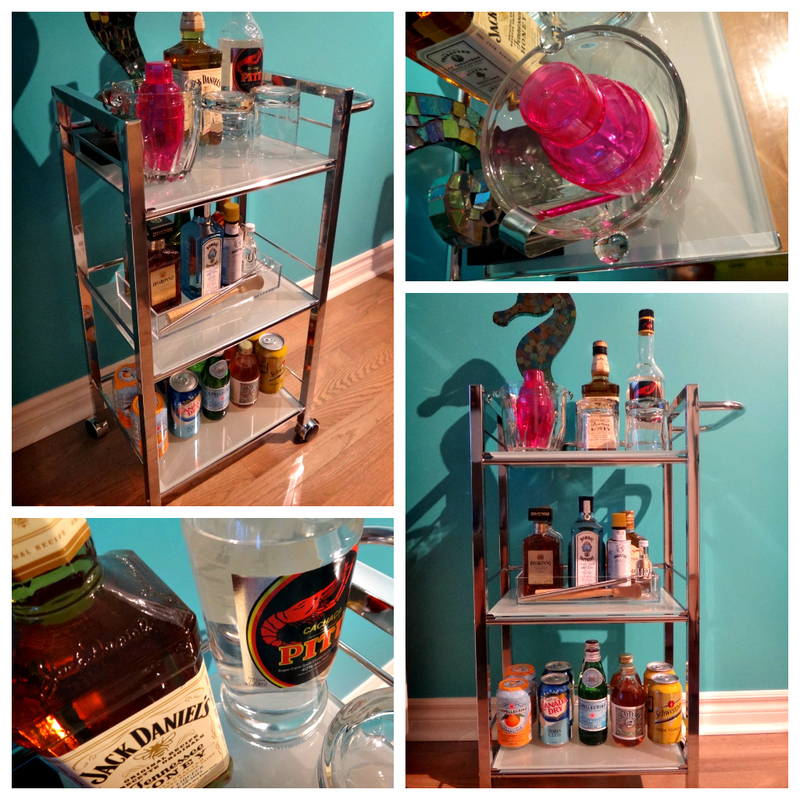 Well, Mike got the idea in his head that he wanted a bar cart (maybe from watching too much Mad Men - I've never seen an episode) and then when he gets obsessed, so do I! I put together a pin board to get some inspiration. All week, we were looking for ideas, especially looking for a place to buy a cart. We needed something small and inexpensive since we live in a condo. Mike even thought of buying a white changing table (that's right, a baby diaper change table) but no one on Kijiji was getting back to him with the dimensions. Finally we saw a white kitchen cart at Kitchen Stuff Plus we thought would work. It was clunky and too big for the little space in our condo we had to work with. And then, we came across the perfect cart. Believe it or not, it's actually a bathroom toiletry cart and the bonus is, it was cheaper than every other cart we were looking at. Once we bought the cart, we hit the LCBO (our local liquor store) and stocked up on the staples (whiskey, brandy, cognac, amaretto and rum - yes, we forgot vodka). We decided to mostly buy the smaller bottles since the cart isn't that big. We also went to Whole Foods to buy some San Pellegrino and ginger beer, as well as Crate & Barrel to buy some bar accessories. There are some other items we still need to add like colourful straws, a napkin holder for the cute napkins I got, coasters and more glasses. The key is to stock your cart with what you like to drink. Sure, I thought about buying really cool-looking bottles of spirits but what's the point if you aren't going to drink it. Originally we bought a small skinny vase to put a couple of bright flowers in it but Mike found a mosaic seahorse that worked perfectly with the cart. Now we will use that vase for straws. Purchasing the cart and all the items for it was a Saturday afternoon well spent. We celebrated our success with a Caipirinha (Mike's favorite drink) and look forward to adding more items as we discover more delicious drinks. I'm glad we found the perfect cart for our place and now we can put our obsession to rest. Jessica Alba | She is my #1 crush. She looks great all glammed up but I love her look when she is dressed more casually with her trademark scarf and sunglasses. She also looks amazing after having two kids. Lauren Conrad | She was lovable on Laguna Beach. If I were in high school, I'd want her to be my best friend. On The Hills, I felt her pain as she had her heart broken but it wasn't until after all the reality TV where she really came into her own skin with her glam California look. Just like Jessica Alba, she look gorgeous dressed up or down. Blake Lively | She is just HOT! She has legs that go for miles and beach wavy hair that all girls crave. And it totally helps that she is dating Ryan Reynolds. If you want to join in every Thursday, click on the logo below. I think I am going to look forward to Thursdays from now on.